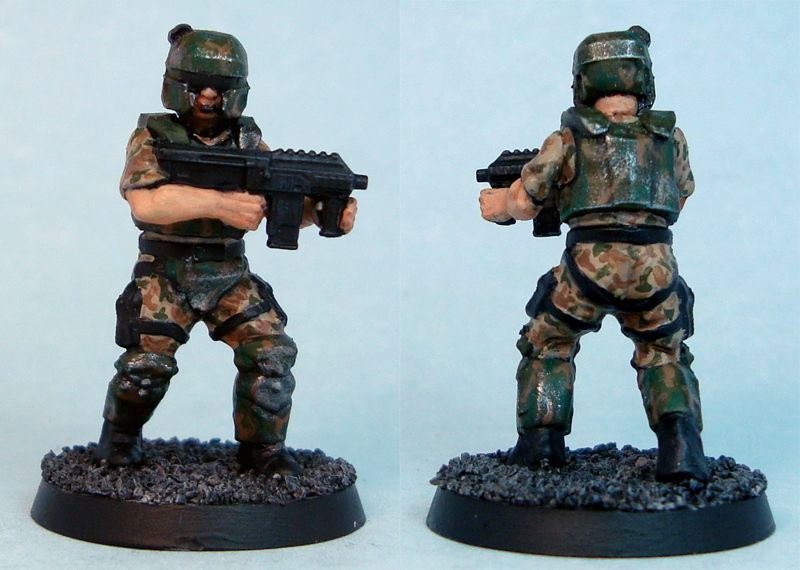 Some painted stuff for a change, with yet more troopers joining my Colonial Marine/generic scifi force. 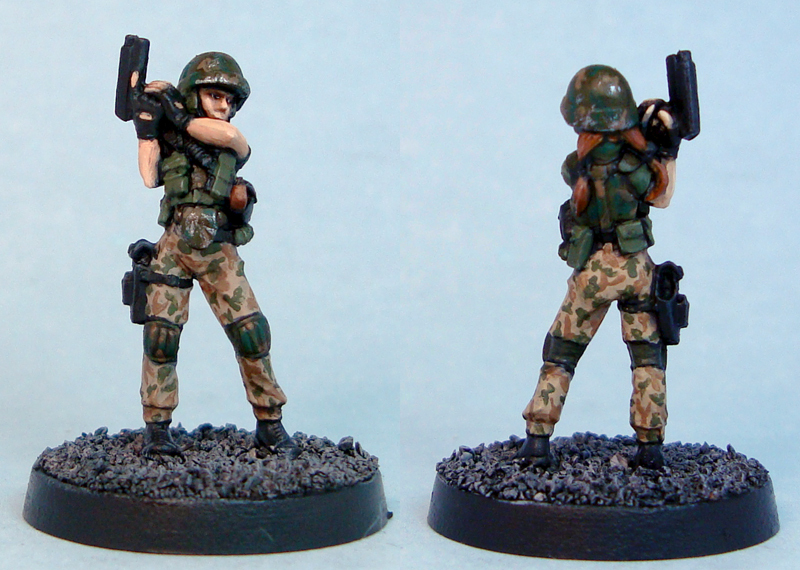 The first is another one of Defiance Games‘ UAMC marines. While the crispness leaves much to be desired, they’re still fun to and simple to paint and make for a nice addition to the force. The second mini is a different story altogether. Hasslefree Miniatures‘ McKenzie has been a favourite of mine since I first saw pictures of the green on the FU-UK forum years ago. You know how some miniatures are just so nice that they almost intimidate you into not painting them? That’s what happened to me here. Eventually I managed to tackle the task and I’m very happy with how the model turned out. It’s a great sculpt, with plenty of detail without getting too cluttered. I also think that the Colonial Marine paint scheme fits the model something lovely. As always, constructive critique and other comments more than welcome. Brilliant job, I agree, McKenzie is a great fig, I have her and a few other HF figs in my stash, I had to buy them even though a swore off 28mm Scifi. Thanks for the comment! McKenzie is one of my all time favourites for sure. Everything just fits together so nicely – the pose, the kit, everything. Maybe this’ll encourage me to take on a few more HF minis. I think that I said this before, but your rendition of the Colonial Marine camo scheme has got better as you have progressed through the project. Hasslefree miniatures are intimidating for sure, but always worth it. Thanks Paul! By my count I’ve now painted the same camo scheme approximately 30 times now, so I’m glad if there’s some improvement showing! You’re right about HF minis, once you get past the intimidation, you’re pretty much always on to a winner.